“Tekkaman: the Space Knight” or “Uchuu no Kishi Tekkaman” is a 26-episode TV series from 1975. Though this series never completed its original planned run of 52-episodes, it would later be reinvented in 1992 as “Tekkaman Blade”, known in the US as “Teknoman”. 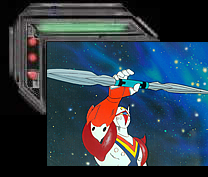 The original concept was conceived of by the founders of Tatsunoko Studios, the Yoshida brothers: Ippei Kuri, Kenji Yoshida, and Tatsuo Yoshida; one of its Chief Directors was Hisayuki Toriumi, Director of “Area 88” and “Salamander”, and Original Creator of “Dallos”; and its character design was done by… Yoshitaka Amano, Original Designer of “Casshan”, “MOSPEADA”, and “Vampire Hunter D”. I have only seen the 1992, two volume, English dubbed, compilation release of this anime. Due to over population, and increased pollution caused by the usage of space-age technology, Earth will soon be unable to sustain mankind. 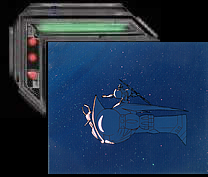 The spaceship, Space Angel, captained by Robert Gallagher, sets off into space to find a new planet fit for human life. However, before leaving our solar system, the starship is attacked and destroyed by the evil alien empire of the Waldarians (originally named Waldaster). After the alien attack, the combined Earth government of the future sends a small group of scientists, led by Dr. Adams, to try to engage in peace negotiations. In response to Earth’s futile attempt at making peace, the vicious Waldarian Commander Randrox (known in Japan as Rambos) proclaims the aliens’ goal of enslaving mankind, and massacres the entire peace force. At the World Science Center (WSC), Dr. Richardson/Dr. Amachi, associate and friend of both Robert Gallagher and Dr. Adams, equips the “Space Knight” Barry Gallagher/Minami Johji, nephew of Robert, with his newest creation: a prototype power suit made from a secret indestructible alloy known as Tekka. Within the interlock chamber of the giant robot Pegas, Barry/Johji dons the previously untested suit to become the armor clad space knight, Tekkaman. With the help of the friendly aliens, Andro and Mutan, as well as Dr. Richardson’s daughter, Patricia/Hiromi; Barry/Johji must fight to protect our planet from the vile clutches of the Waldarians/Waldaster. A pretty cool action anime with imaginative alien, and armor designs; and colorfully detailed 1970s sci-fi backgrounds of amazing “hi-tech” machinery. But, similar to many other super hero anime, the episode plots are very formulaic. And the underlying, scolding ecological message (way back then already being overused) is poorly done and uninvolving--not to mention that it lessens the punch of mankind “fighting to save our home world” if we are planning to give it up anyway. Still, I never tire of watching badass heroes taking on evil alien hordes!